With the ignition on, press this button. The indicator lamp in the button comes on, accompanied by a message to confirm that the child lock is on. This indicator lamp remains on until the child lock is switched off. It is still possible to open the doors from the outside and operate the rear electric windows from the driver's control panel. With the ignition on, press this button again. The indicator lamp in the button goes off, accompanied by a message to confirm that the child lock is off. This indicator lamp remains off while the child lock is switched off. Any other status of the indicator lamp indicates a fault with the electric child lock. 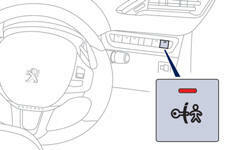 This system is independent and in no circumstances does it take the place of the central locking control. Check the status of the child lock each time you switch on the ignition. Always remove the key from the ignition when leaving the vehicle, even for a short time. In the event of a serious impact, the electric child lock is switched off automatically to permit the exit of the rear passengers.